Sound is caused by very rapid changes in the air or other medium, alternating between what are called "condensation" and "rarefaction", with the disturbance spreading through the medium, or what is called "propagation". The rate of change, or frequency, is measured in cycles per second, the units being referred to as Hertz, after the discoverer of the process. Sound frequencies audible to the human ear fall in the range 20 Hz to 20000 Hz. Sound travels through the air at about 343 metres per second. 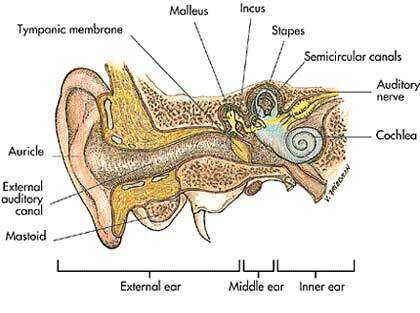 Sound waves are transmitted from the passage way of the external ear to the structures of the middle ear and inner ear shown in the chart above, and finally transmitted as nerve impulses from the cochlea through the auditory nerve to the brain, where the impulses are interpreted and understood. Conductive hearing loss, which results from injury or other problems with the structures that transmit sound from the external and middle ear to the inner ear. These are generaly remedied by medicine or surgery. Sensorineural hearing loss resulting from damge to or deterioration of the inner ear or auditory nerves, and hearing aids may be the main solution. Assistive Listening Devices (ALD’s), or Hearing Aids as they are more commonly called, are of four broad types : Acoustic, FM, Induction and Infrared. Acoustic Devices use a microphone to amplify the sound which the listener hears directly – typically public address systems. FMs utilise Radio Frequenciy patterns corresponding to sound patterns from a radio transmitter with the speaker to a radio receiver with the listener. This technique eliminates ambient noise which would otherwise muffle or drown the sound. The Induction type and the Infrared devices use magnetic fields or infra red waves to carry the sound form the source to the destination. Hearing Aids must be selected and fitted, after testing by a qualified audiologist. They are available in a wide range of prices, depending on the technical features that are provided in them. The least expensive provide volume control only, while the more expensive models are adjustable for the frequency levels at which the user hears best and for filtering out background noise that interferes with the hearing. The Cochlear implant is an advanced and expensive surgical technique to help in cases of total hearing loss. Here a special device inplanted by surgery takes the place of the cochlea and performs it’s function of conversion of incoming sound energy into nerve impulses which are transmitted to the brain.